A bus rapid transit line (BRT) is planned from St Stephen’s Green in Dublin City Centre to Swords in north County Dublin — In a series of articles we’re going to detail why the plans do not meet the quality requirements of BRT and how the route has too many compromises for walking and cycling. The BRT drawings and visuals which we are reviewing here are part of the official public consultation process. While the NTA has talked the talk on cycling with its Greater Dublin Area Cycle Network Plan, the detail of the BRT route shows how cycling is likely to be treated in reality. The artist’s impression above shows how poorly cycling and the BRT route is being treated here — a cycle lane in the door zone of parking spaces without any buffer zone, inside a contra-flow bus lane, and, on the other side of the road, a cycle lane running past the platform edge of a BRT stop. Earlsfort Terrace is possibly one of the best examples on the route of trying to accommodate everybody and everything — normal bus stops, a BRT bus stop, access to off-street car parking, cycling, taxis, parking, DublinBikes stands in former parking spots. The mess of this street and the lack of priority on Leeson Street (see below), all begs the question: If the NTA and the city council were unwilling to give BRT decent priority on these streets, why did the route not end with a loop at the stop off St Stephen’s Green East? Note the width of the bus lane, pictured above, on the right end marked “A” where the cross-section was taken from, and now note the width of the bus lane on the left of the image. Spot the issue? The once separate 3 meter wide bus and 1.75 meter wide cycle lane are merged into one — giving unexpecting bicycle users a false sense of security before the design directs an unwilling bus into their path. 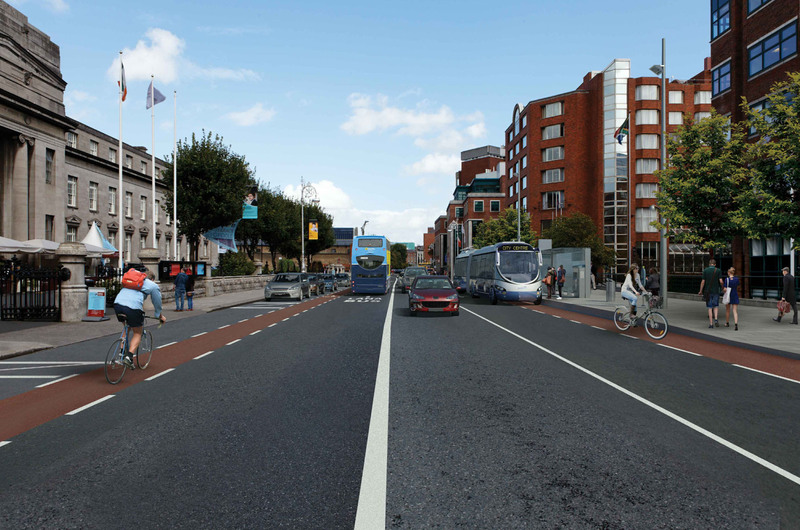 Around the block, the above cross-section (B-B) shows Leeson St with 1.2 meter wide cycle lanes. So, much for the Cycle Network Plan and the National Cycle Manual — this is the quality to expect on the city centre end of primary Route 12 from Bray to St Stephen’s Green — enjoy. It’s worth saying again: 1.2 meter cycle lanes. At the west end of Leeson St (the street show at the top of the image) the BRT route has looped back to St Stephen’s Green and the other end of Earlsfort Terrace (right) — the other streets are St Stephen’s Green South (bottom) and St Stephen’s Green East (left) where the BRT route heads to the northside. Footpaths and footpath-traffic islands are narrowed as part of this project, but the NTA has not dared to slow down traffic even slightly by following the advice of the Manual for Urban Roads and Streets — which is claimed to be a mandatory documents which project designers must follow. “Omit left turn slips, which generally provide little extra effective vehicular capacity but are highly disruptive for pedestrians and cyclists. Where demand warrants, they may be replaced with left tuning lanes with tighter corner radii (see Figure 4.59). Rather than following the manual, large volumes of pedestrians are left at a disadvantage of using staggered crossings; people cycling coming from Leeson St and turning left onto St Stephen’s Green East have to cross a large junction and then cross the exit of the slip road junction; and those cycling from St Stephen’s Green South to St Stephen’s Green East are left unprotected inside of fast moving traffic. The NTA’s own Cycle Manual also says to remove slip junctions. Then as if the slip junction is not bad enough, the cycle lane moves out further as motorists are still turning. The above image is from the National Cycle Manual — if you look at the last image you’ll see that the NTA has not followed its own advice about protecting the cycle lane where it shirts out into traffic — called a horizontal transition. Most of the rest of St Stephen’s Green East is shown with dashed-lined cycle lanes — when the National Cycle Manual says these are overused and that solid-lined lanes should be used as standard. They do not care so long as they look after the Motorists by allowing them still to use that road and also still allow them to park on what is going to be a very congested area. They need to get rid of the Motorists and also the Ordinary Dublin Buses on the route if the want to put in a Bus Rapid Route. 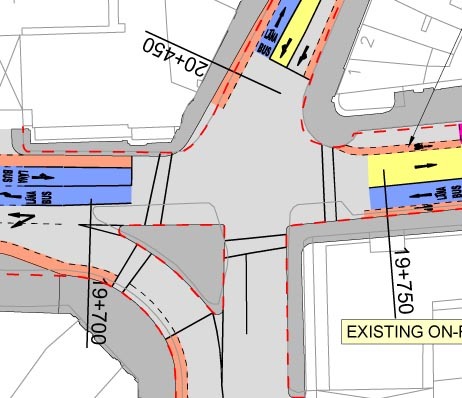 This area will be so obnoxious that Cyclists will travel on the Canal Cycle Route to the Nth Side or else Bypass the area by going to Rathmines from the Bray road and go by way of Camden Street. Any Cyclist that has to go through that area will Suffer big time by dodging and ducking the Traffic. The whole idea is for the birds. It represents massive investment in diesel powered transport…. when another part of government is about to commit to massive reductions in C02 emissions, and talking about an existential threat to the human race from climate change. Swords BRT is for buses you know!! !